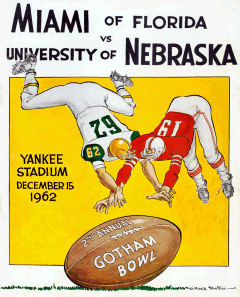 Playing under coach Bob Devaney, Nebraska won its first bowl game in three tries, upsetting Miami and George Mira, 36-34, in the second and last of New York’s now-defunct Gotham Bowl. The Huskers and Hurri­canes, playing in mostly empty Yankee Stadium in sub-freezing weather, put on one of the greatest bowl shows ever, trading touch­downs in every quarter. Willie Ross’ 1-yard plunge and Bill “Thunder” Thornton’s subsequent two-point run gave the Huskers a 36-27 lead with 12:10 left. Mira, who passed for 321 yards while completing 24 of 46 throws, led a valiant comeback attempt but was thwarted by a last-minute inter­cep­tion by Husker guard Bob Brown at the Nebraska 25 with 1:20 left. 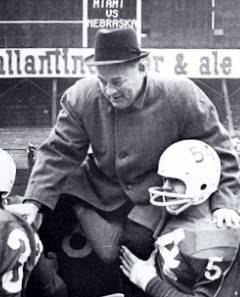 The Huskers were well-practiced at two-point conversions. Rudy Johnson’s second-quarter PAT placekick was the first one attempted by Nebraska in a span of 15½ quarters stretching back to the Missouri game on Nov. 3.